What Can Calumet Specialty Products Partners Do to Fix its Debt Problem? Calumet's overly onerous debt load is preventing the company from any chance at making a decent return for investors, and big changes will need to come before it's worth considering. There's no nice way to say this: Calumet Specialty Products Partners (NASDAQ:CLMT) is morbidly bloated with debt, and it keeps getting worse. Back in April, the company issued $400 million in senior notes that carried a coupon rate of 11%. Any company that needs to pay interest rates like that on their debt are going to struggle immensely to generate any kinds of returns for its investors. Management has stated on many occasions that it wants to reduce its debt, but we haven't yet seen the company do much about it. If the company really wants to get serious about lowering its debt levels, it will need to do some serous house cleaning that may not be popular today. How did it get here in the first place? Like so many other tales of debt problems, Calumet's issues can be traced back to a few years ago when the company went on a bit of an acquisition and growth binge that was out of its wheelhouse. In 2013, the company acquired its San Antonio refinery from Nu Star Energy and it started the construction of a diesel refinery in North Dakota to take advantage of growing Bakken production. Both of these facilities are more traditional fuel refineries and don't produce the specialty lubricants, waxes, and other non-fuels products that Calumet was known for at that time. That spending begot more spending as it acquired gathering assets for that North Dakota refinery as well as look to expand into more commodity related products like asphalt. If getting into commodity refined petroleum products wasn't enough of a stretch of the company's core competencies. In 2014, the company then started to make investments in oil based drilling fluids, which somehow translated into the acquisition of an oil services unit. Perhaps at the time that argument could have been made that the growing need for drilling fluids could make for a tempting investment, but there aren't many business overlaps between the manufacturing of non-fuel based petroleum products and oilfield services. All of these acquisitions and investments added up pretty quickly, and the company's master limited partnership structure also meant management thought it could pay out a huge distribution to shareholders instead of reinvesting cash back into the business. Add it all up, and you have a debt load that has more than tripled in 5 years. Even if the company could have translated those investments into stable and growing cash flows, one would have to question the company's decision to go out of its wheelhouse to acquire this smattering of businesses. The fact that those investments only seem to generate losses stings even more. It was only during 2015 when refining margins were at their highest in decades that the company could generate decent profits from its fuels segment, and its oilfield services business has been a drag on the business since 2015. Debt reduction and generating profitability from its core specialty products segment is at the core of new CEO Timothy Go's short term strategy for the company, and Calumet is already starting to shed itself of some unproductive assets. Just last June, the company announced that it had sold its stake in the North Dakota refinery that it had decided to build back in 2013 for cash and an assumption of Calumet's portion of debt deal worth $66 million. It's much less than the $75 million that Calumet put into the project, but the facility has been losing money since the day it opened and is likely to run at a loss for some time, so just walking away from the project will be a bit of a relief. To really get its debt load under control, though, it needs to do much more than this. The first thing that would go a long way for the company is to divest of non-core assets like its oilfield services division. While it probably won't fetch a great price today, the business segment has simply been too much of a drag on the business to justify keeping it around for much longer. Another thing that the company could consider is winding down its exposure to fuels by divesting of some refineries that do not have significant specialty product manufacturing ability. Management believes that it can achieve better results from this segment by tweaking the facilities to use more disadvantaged crudes such as heavy Canadian oil, but if that is the case we will likely have to wait several quarters before we see any effects of this. Based on where Calumet Specialty Products Partners is today, investors have no business looking at this company. 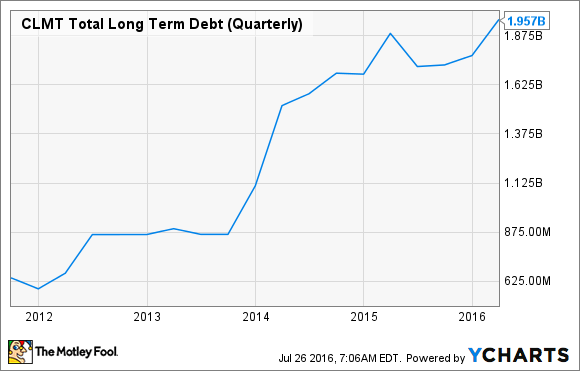 Its debt loads are far too great for the company to be a profitable venture for a very long time. If the company were to do some significant debt reduction and get back to its roots as a specialty petroleum product manufacturer, then maybe we can revisit this company in the future. For the time being, it will be best to sit on the sidelines and watch to see if Calumet can drag itself out of this hole.